I know. Another braid. It's an obsession. Perhaps it's because I grew up with braids. Yes, I was the Dutch girl with braids. Tempting, they were (at least to Dennis D, who sat behind me in fourth grade and played giddy up with them on a daily basis). At any rate, I have to share my one last braid recipe with you, this time a savory one. You may recall that a few months ago I had the opportunity to visit the Red Gold Tomato Company. I won a blogger contest and was able to travel to Indiana, where I met up with six other bloggers and was treated to a tour of the Red Gold facilities and a night to remember at The Taste of the NFL. While there, we were introduced to the family behind the Red Gold Company, the Reicharts. I got the feeling they were a little confused as to what kind of recipes The Dutch Baker's Daughter could come up with using canned tomatoes. How do baking and canned tomatoes go together? I ended up promising Brian Reichart, Red Gold's CEO, that I would come up with a pizza bread of sorts. 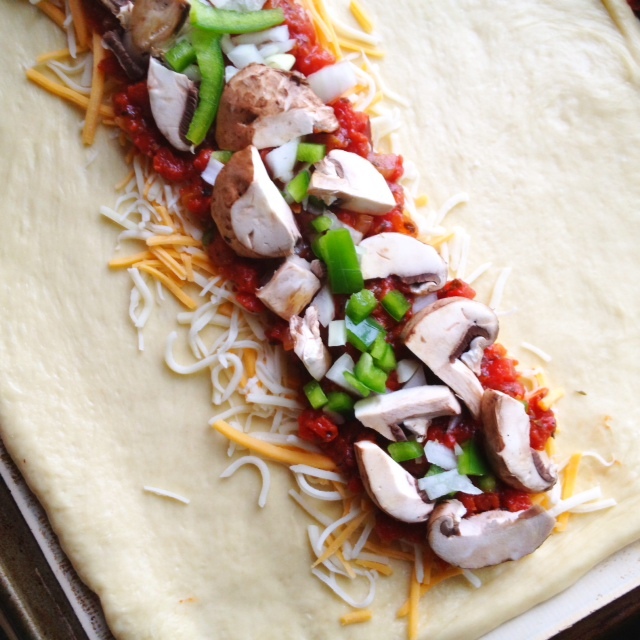 I think a pizza braid fits the bill, don't you? I had a flavor combination in mind when I started my little pizza braid project....I was looking for a slightly sweet, soft dough wrapped around a spicy sauce. Contrasting flavors, if you will. So, while you can certainly take a shortcut and use frozen bread dough or canned pizza dough, I urge you to try my homemade variety...you won't be sorry. First, we want to start with the sauce. I made this right before I used it, but it may taste even better if you make it a day ahead. Feel free to add a little salt--we cut back on it at our house. Heat the olive oil in a large saucepan over medium-high heat. Add the onions and sauté until they are soft, about 4 minutes. Add the garlic and the wine; cook for an additional minute. Stir in the tomato paste, diced tomatoes, Italian seasoning, pepper flakes and black pepper. Reduce the heat and simmer for 20-25 minutes or until thickened. Stir in the vinegar; cool. For the dough, I borrowed heavily from the King Arthur Flour braid recipe, but I had to cut back on the sweetness and add a bit of savory....adding a little Parmesan cheese helped with that. For the sponge, combine the water, sugar and yeast in a medium bowl. Stir in the flour. Cover the bowl loosely with plastic wrap and let it sit for about 10 minutes. I didn't brush the first loaf with egg wash...it wasn't as pretty. I ended up sprinkling dehydrated onions on the top of my braid...it gave it a little something. I would love to hear what you would put in your pizza braid. Sauerkraut? Baked beans? It's all good. I'm a braid fan. You've officially converted me! And I think you did fabulously with this recipe. YUM! Oooo...love how you created this. Looks amazingly delish. Thanks for sharing such luscious recipe again. Enjoy your day! This is fantastic, I love stuffed breads and this braid is definitely stuffed. I really want to make this. Beautiful job. Oh, I'll bet Red Gold is thrilled with this dish! It looks fantastic. I love your spicy sauce just as it is. I love braids, homemade bread, and pizza toppings. I'm adding this to my list of things to try as soon as possible! Looks absolutely perfect! I can see my Man loving this :) Thank you for sharing! Such a fabulous weekend, Linda! :) I hope you are all doing well. Wow it sounds & looks great!!! I've always been a sucker for a braid as well - they just look so beautiful that it always seems like such a treat to eat one! This is a perfect way to "bake" tomatoes. I love Red Gold. They have a great flavor and so many different varieties! Good choice!! I agree, Kristen. There are so many things to use Red Gold tomatoes in...baking and cooking! Thanks, Liz. The thing is, now I'm thinking of all sorts of things to stuff in a braid, lol. Wow! This looks seriously Ah-mazing! Michael would LOVE this! It baked up so pretty, Cathy! Gosh...hard to believe our trip was already 3 months ago. Such a fun weekend!! I have only used Oreo and graham cracker crusts in my square tart pans. I think a pastry crust might be easier (except for the rolling out part!). If I get my courage up, I may try that next! Looks delicious! I want a reunion too. I miss you all!